New Vessel Press, 9781939931498, 285pp. "This extraordinary little book touched me deeply. Part graphic novel, part literary archeology, the author slowly unpacks a dusty cellar, and brings her subject to life. Even Madeleine's recipes have risen. Who would have guessed Twitter could be so poetic." A young woman moves into a Paris apartment and discovers a storage room filled with the belongings of the previous owner, a certain Madeleine who died in her late nineties, and whose treasured possessions nobody seems to want. 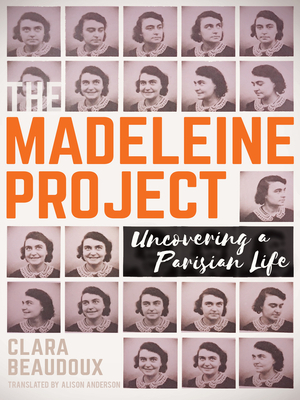 In an audacious act of journalism driven by personal curiosity and humane tenderness, Clara Beaudoux embarks on The Madeleine Project, documenting what she finds on Twitter with text and photographs, introducing the world to an unsung twentieth-century figure. Along the way, she uncovers a Parisian life indelibly marked by European history. This is a graphic novel for the Twitter age, a true story that encapsulates one woman's attempt to live a life of love and meaning together with a contemporary quest to prevent that existence from slipping into oblivion. Through it all, The Madeleine Project movingly chronicles, and allows us to reconstruct, intimate memories of a bygone era. Clara Beaudoux is a Paris-based journalist for the France Info news network. The Madeleine Project has been wildly popular in France. You can follow her on Twitter at @Clarabdx. Reading group guide to The Madeleine Project, as well as a related recipe booklet, is available free of charge at newvesselpress.com. Clara Beaudoux is a Paris-based journalist for the France Info news network. Her documentation of The Madeleine Project gained thousands of followers on Twitter when she initiated it in November 2015. Alison Anderson is a novelist and a translator whose previous translations include The 6:41 to Paris and The Elegance of the Hedgehog. She lives in Buchillon, Switzerland.